Analogue pitch shifter using phase sequence arrays and two double balanced modulators. This document summarises the workings of an analogue based frequency shifter for musical electronic effects. It is not intended to provide a pitch shift in the usual sense of frequency multiplication, like speeding up a tape, rather a genuine frequency addition. As such, it will not sound harmonically accurate for anything other than very simple sounds shifted over small ranges. This is intentional for this particular effect. Effectively, this is a suppressed carrier single sideband generator where the carrier frequency can be reduced all the way down to zero Hz, and to negative frequencies. Back in 2001 or so I thought I'd make one of these becuase I'd always wanted to. At that time I'd never heard of the 1974 Bode/Moog design, though inevitably this ends up being quite similar in terms of functional blocks. When I was introduced to the Bode design around 2002 I saw that it had certain advantages over mine, mainly the ability to produce up and down shifts simultaneously and have a bipolar linear CV voltage shift up and down alternately. The most recent incarnation is described here. This sheet starts with an input filter network. This is two three pole bandpass filters with the HPF Fo about 50Hz and the LPF Fo about 15kHz. This limits the input bandwidth to the phase sequence array, which can produce 90° phase shifts only over a limited bandwidth. The array is driven with a true and inverted signal, and the array outputs are buffered to feed the following circuitry. The phase sequence array itself has a gradual -4dB dip mid-band and the input filters partly compensate for this. The exact values of the capacitors are not critical but each value set should be matched to 1%.The S_0 and S_90 output buffers provide convenient input points for the carrier feedthrough trims. +/-5V 100mA regulators provide local voltage references. This sheet starts with a control voltage exponentiator which is a standard 1V/octave type as seen on other designs. This is followed by a quadrature output VCO which provides both positive and negative output frequencies depending on the polarity of the control voltage. It provides a function that has traditionally been implemented in the Bode/Moog frequency shifter by using a fixed BFO at 20kHz and a variable sine oscillator going above and below 20kHz, both feeding into mixers. This new circuit reduces the number of oscillators to one, and uses no mixers. As a result the output has fewer spurious harmonics and no unharmonically related harmonics, resulting in a cleaner output overall. Only minimal and easy trimming is required with no interacting trims. Zero CV input results in guaranteed zero Hz output, dependant only on well controlled op-amp offsets, rather than a front panel adjust to zero beat two oscillators running at 20kHz. No possiblility of oscillators 'locking' when close in frequency. Typical 40dB carrier to next largest harmonic ratio, and no non-harmonically related mixer image outputs. The two lower transconductance amplifiers form a standard double integrator bandpass-lowpass filter as shown in the Nat Semi data sheet for the LM13700. These lower TAs are active for positive control voltages, and the upper TAs are effectively turned off by being fed no bias current; These play no part when the CV is positive. The TL074 op-amps are merely buffers to enable easier choice of resistor values on the TA inputs and to make sure that the integrator capacitors are not loaded excessively. The resistor values set Q to be >1. Feedback from the bandpass output to the non-inverting input via the diode limiter provides feedback to make the filter oscillate. Adjusting the trimmer gives output amplitude trimming and allows the drive to the diodes to be set to a level that ensures oscillation but minimises distortion. This fairly standard configuration gives quadrature outputs from the two buffers with the highest distortion product about 40dB down on the fundamental. For negative control voltages the upper TAs are fed bias current and the lower TAs are shut off. The upper TAs work in exactly the same way as the lower ones but they are cross connected to the inputs and integrator caps. In this way the in-phase and quadrature outputs are reversed for negative CV, thus creating an inherently smooth transition to what can be considered to be a negative frequency. In operation, viewing the outputs on an X-Y trace the circular rotation of the dot becomes slower as the CV is adjusted to near zero and then reverses direction perfectly as the CV goes negative, without any unwanted crossing of the circle or drifting off beyond the circle. This is true provided that the transition to -ve CV does not take many seconds. The two current sources are fairly self explanatory, with the upper source operating for -ve CV and vice versa. The gain trimmer on the upper source allows the oscillator to be adjusted such that a given -ve CV gives the same frequency as the equal magnitude +ve CV. This compensates for differences in Gm of the two separate dual TA packages. 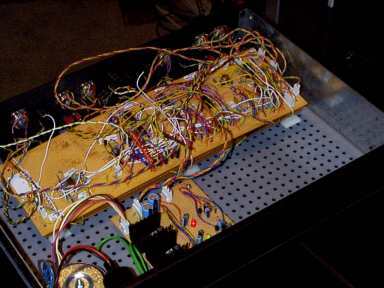 The diodes across the op-amps avoid heavy output saturation when that source is turned off. Low Vf Schottky diodes are better in this application. Both oscillation modes need to be trimmed to give equal output amplitude using the diode limiter drive trimmers. A front panel switch selects LOG or LIN CV and a range switch reduces the oscillator frequency when closed. For +/-10V linear CV the oscillator should give about +/-10kHz.
. outputs of the phase sequence array. For a given sine input to the array, this scanning creates a situation analogous to doppler shift where the listener is running towards or away from a sound source and therefore intercepting more or fewer wavefronts. Readers may note the similarity here between this pitch shifter and the original Hammond organ scanning vibrato, though the Hammond LC line is closer to a true delay than this, wholly phase shift oriented design. For this reason the Hammond vibrato preserves the harmonic relations of the signal better than this design, though far from perfectly. The phase-shift only nature of the pitch shifter allows us to "scan" and thus frequency shift, in one direction continously, while the Hammond LC line has to be scanned up and down due to the time discontinuity that would be experienced when trying to flyback to the start of an LC line. 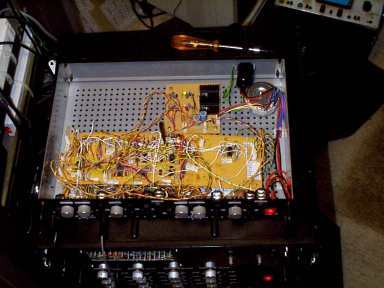 The output from the second board is taken back to two summing amplifiers on this board. One sums the output of the two boards to form a duo chorus output. The other sums the output of both boards plus the input to board 1 to form a trio chorus output. The signal switching of the front panel jacks is arranged so that the input to board 1 is fed to both board 1 and board 2 when there is no jack connected to the board 2 input. This repeats sheet 3 of board 1 but has an extra audio output connector and no duo/trio summing. The MC1496 devices can be quite variable between devices and manufacturers in terms of the maximum trimmed carrier feedthrough level. The actual carrier feedthrough could be trimmed well, but on some devices a good deal of carrier second harmonic was fed through and this could not be trimmed away. The performance of these modulators is the limiting factor in this design in terms of carrier feedthrough reduction. AD733s are no better and are much noisier, as well as following the usual Analogue Devices design ethic of being highly expensive, and having their multiple pathologies unmentioned or well buried in the data sheet. The Bode/Moog design has a noise gate 'squelch' control. I ran out of front panel space completely so didn't include this feature. Jurgen Haible's frequency shifter design uses analogue companding to reduce the measured feedthrough on low level signals, and perceived carrier feedthrough on high level signals. This works in a manner superficially similar to that used for noise reduction on Dolby enabled cassette recorders. This is a very good idea . I may add this feature, but with a defeat switch. Over-polishing a sound can make it less interesting. Have you ever heard "Switched On Bach volume 4" and compared it to the original? The Bode-Moog design used a transistorised all-pass phase shift array. Jurgen Haible uses the op-amp version, which I've copied in the ambisonic microphone UHJ encoder. I've had to admit that is a better circuit than the phase sequence array shown here. Board 1 is not visible; Being as it is, underneath board 2. Wendy Carlos doing a spiele about Switched On Bach and being shifted first down, then up, and then all over. The left channel of the 3rd Brandenberg concerto going into the shifter and coming out of RING1 and RING2 and being fed to left and right channels. The first few bars are with the carrier frequency set very low so you can hear the panning effect. This is great on headphones but especially good over stereo speakers, as the inverse phased sidebands from the two ring modulators cancel or add depending on where you are in the room and how your head is positioned. This makes some of the sounds disappear and reappear as you move. I'm sure this sounds better uncompressed but there's not enough space for a wav file here. You can hear the carrier feedthrough on the silences between the speech. I'm sure you could make really good modulators out of LM394s or even CA3046s using emitter degeneration on the carrier input transistors. Even matched discrete transistors might be better than this, but for the moment I am going to satisfy myself with picking and choosing from a batch of MC1496s. Similar effects can be experienced when using my surround panner system at high pan rates.